Preheat the oven to 325 degrees F. Bring a large saucepan of salted water to a boil. Add the macaroni and cook until slightly al dente, about 10 minutes. Drain and set aside to keep warm. Whisk the eggs in a large bowl until frothy. Add the Cheddar Cheese Soup, butter and 2 cups of the half-and-half to the large bowl of eggs. 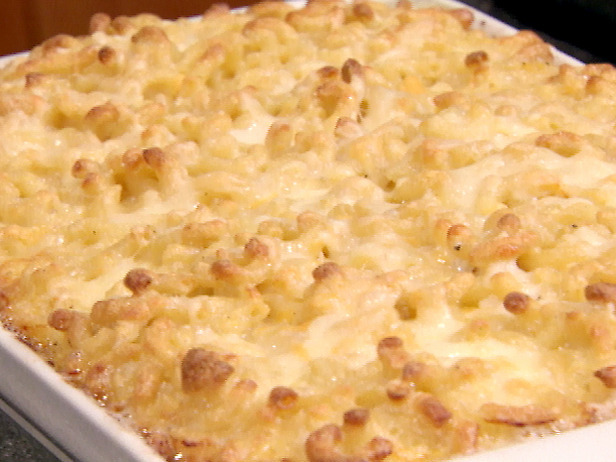 Add the warm macaroni tossing until the cheese has melted and the mixture is smooth. Add the remaining half-and-half, 1 Cup sharp yellow Cheddar, the remaining grated cheeses, and salt and pepper, tossing until completely combined in the large bowl. Pour the mixture into 9 by 13-inch casserole or baking dishes (approximately 3 (3-quart) baking dishes) and bake for 30 minutes. Sprinkle with the remaining 1 cup of sharp yellow cheese and bake until golden brown on top, about 30 minutes more.